Living in the Rocky Mountains of Colorado means living with wildlife. Perhaps no single animal symbolizes the wild in wilderness more than bears. Only black bears call Colorado home, as Grizzly Bears were hunted to extinction early in the 20th century. The name can be misleading though. Black Bears can come in all different colors ranging from blonde to light brown to yes, even black. 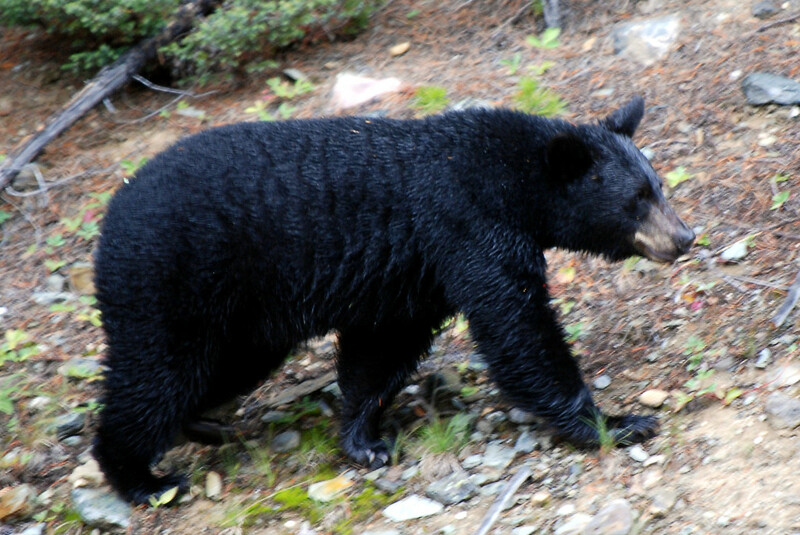 Black bears in Colorado average 250-350 pounds. Considering their natural food sources include grubs, berries, roots, and other plants, it’s easy to understand why they would seek out human food. Bears have figured out that where there are people, there is easy access to food. Thus the multiple postings about this particular bear that was seen near Ridge Road. Unfortunately once a bear gets rewarded by any human food, they will come back again and again. And to a bear, human food is anything from sugar water in a hummingbird feeder to garbage. Each time they return, they will become bolder and more aggressive. Naturally black bears are not aggressive. Because they are not predators like a mountain lion, they don’t attack human beings typically. Most bear attacks are of a defensive nature — mothers feel their cubs are threatened, or they are trying to protect their food. Almost all the times I have seen black bears while hiking, they were doing bear things — scratching a tree, eating wildflowers. As soon as they saw me, they took off running. But once they get a hold of some yummy french fries, or hamburger buns, they risk getting closer to people for their fantastic reward. And they won’t differentiate between one house to the next. The bear will start making the rounds of the neighborhood, trying things that worked at a previous home. A few years ago, a bear even broke through the screen of an open window and raided the kitchen. The saddest thing about all of this is what happens to the bear. Once a bear has been reported to Colorado Parks and Wildlife for a break-in, its days are likely numbered. It’s very difficult to reprogram a bear’s behavior. Some people suggest relocating the bear. But then the bear will just inevitably make its way to someone else’s cabin and repeat the same offending behavior. The bear population along the Front Range foothills is relatively small compared to other wildlife, like mountain lions, elk and even moose. Wildlife biologists at Rocky Mountain National Park estimate there are only 30 or so bear in the entire park. So when a bear has to put down for becoming aggressive, it has a enormous effect on the entire bear population of the area. And it’s a sad day for those of us who live here. One of the most magical things about living in the mountains is being witness to wildlife thriving in their natural habitat. But with that comes a duty to act responsibly. We have to live in a way that doesn’t change their wild behavior. And sometimes that means even sacrificing having a hummingbird feeder, or being able to leave your trash at the curb for pick up. I would never want a bear to die on account of something I did because it was the easier way out. Would you?